This beautiful Duo Sea Turtle Sculpture is handcrafted to the finest detail. 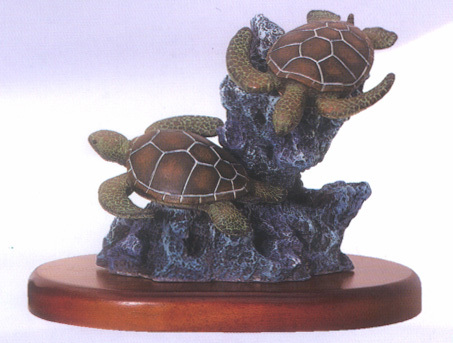 The turtle figurine is detachable from the wooden base so that you can place the turtle figurine on the base, or remove the base and just use the figurine as a stand alone art piece. Makes a great gift item for a friend or loved one! Made of the highest quality poly resin on a wooden base. Base Size: 6 inches W. x 1/2 inches H. x 4.25 inches D.
Figurine Size: 5 inches W. x 4 inches H.